Aerosmith's Steven Tyler and Neil Diamond rocked Red Sox fans as they rang in Opening Day with live performances, including Tyler's "God Bless America" and Diamond's "Sweet Caroline," a Red Sox theme song. Tyler, a Boston-area resident, was accompanied by his daughter, Chelsea, and performed during the seventh-inning stretch. She harmonized with her father at the end of the song. Diamond, whose "Sweet Caroline" is played at Fenway after the top of the eighth, stepped onto the field to sing it in person. The Brooklyn native wore a blue Red Sox hat with a red "B" and a dark jacket with the words "KEEP THE DODGERS IN BROOKLYN" on the back, Boston CBS station WBZ reports. The nice weather was a perfect backdrop for the Red Sox Opener, which also included a flyover by two jet planes and fireworks before the game and a ceremonial first pitch by Pedro Martinez. Then there was the usual serious stuff - another wild game between Boston and the New York Yankees in the latest installment of their rivalry, a game won by the Red Sox 9-7 with two comebacks Sunday in the first night opener in the 98-year history of Fenway Park. 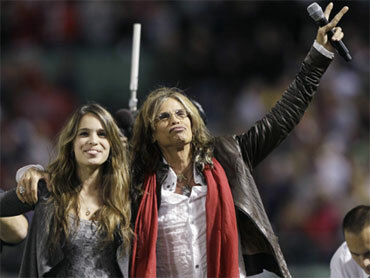 Watch Aerosmith's Steven Tyler and his daughter Chelsea sing "God Bless America." Watch Neil Diamond perform "Sweet Caroline."